Ever since silicone baking molds made their way onto the market, I've been a huge fan. They're naturally nonstick, flexible, brightly colored, and delightfully inexpensive. That said, they're not perfect, and I've had my fair share of silicone-baking-cup disasters. 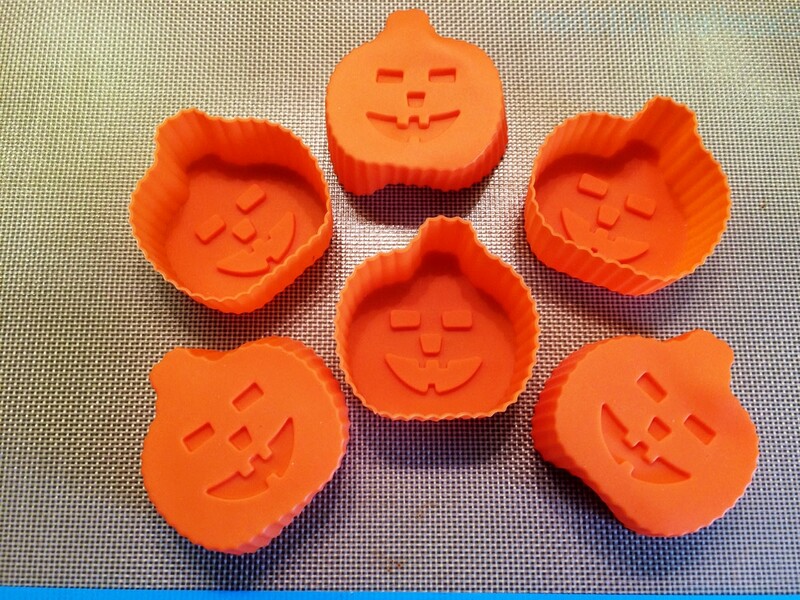 If you're interested in purchasing some silicone baking molds, or if you want to be better at using the ones you have, keep the following tips and tricks in mind. Grease for easier clean up. Soaking makes for easy clean up. Wonderful for savory and sweet items. These molds double as reusable serving containers. Save space and pare down your kitchen collection. Stick to metal for big confections like cakes. Be mindful of temperature ratings. Do the pinch test to make sure it's pure silicone. I've found that, on the whole, smaller silicone baking cups (e.g. mini-muffin cups and cupcake cups) do much better than larger cake pans, mostly because they're more rigid and less likely to bend and crack still-gooey just-baked muffins and cupcakes. Small silicone baking molds are also easier to find, less expensive, and the most versatile (more on that below) sorts available. So, if you buy anything, I'd recommend choosing these. If you only buy one type, get the normal, cupcake-sized ones. If you're willing to get two different kinds, I heartily recommend the mini-muffin cups. Because silicone molds are so versatile and inexpensive, there are a lot of specially shaped ones you can purchase. While they're cute, I recommend staying away from them. They're typically small and less likely to be able to accommodate all of a typical recipe's worth of batter, so you'd either need to buy multiples of one mold or bake a ton of batches. In the name of practicality, I recommend going with just one large baking mold or a matching set comprised of multiple baking molds that can accommodate a full recipe. It might be disappointing to realize this, but novelty and uniquely-shaped silicone baking molds are the ultimate impulse buys of the silicone kitchen-implement world! 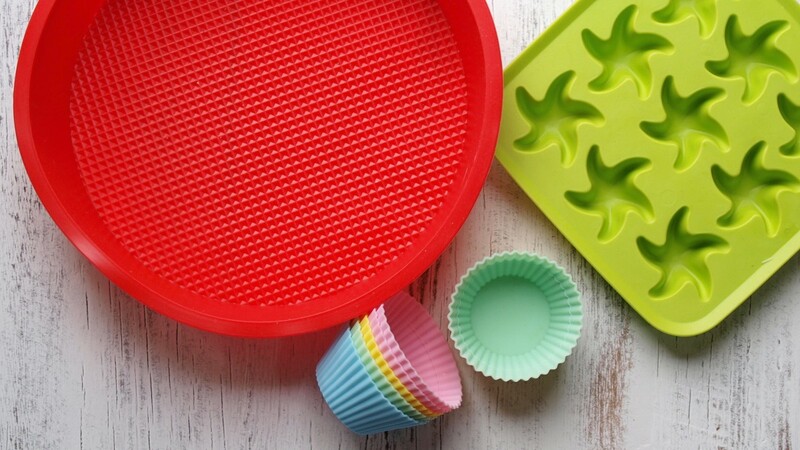 If you do end up getting a couple of novelty molds, one way to make a full recipe's worth of cake or some other bread-like concoction is to amass a collection of different baking molds or to have extra silicone baking cups on hand to make small muffins or cupcakes with the batter that doesn't fit into your novelty-shaped mold. It's nice to have these extra snacks on hand (even if they aren't specially shaped) because they can make for fun leftover treats. Like I said, silicone baking molds are extra convenient because they don't typically require greasing. Still, some baking molds—especially the larger ones—still require greasing or buttering and flouring. Yes, it's a hassle, but it makes a difference, especially because cakes baked in larger silicone baking molds are at a higher risk of cracking in the malleable molds than they would in metal pans. Greasing and flouring pans can be awesome though. One thing I do is substitute cocoa powder for flour when I'm baking chocolate cakes. It contributes to a better exterior appearance and is extra fun to lick out of an emptied pan. While only larger pans really require greasing, it's easier to clean smaller cups when they've been greased. Fully greasing and flouring these cups is not necessary, but you might consider spraying them with some sort of nonstick cooking spray. Alternately, you can keep them entirely clean by putting paper baking cups inside them and just using the cups for structure. The cup on the left has been greased. The one on the right has not. This is how they looked after I cooked some muffins in them. I'll let this photo speak for itself! 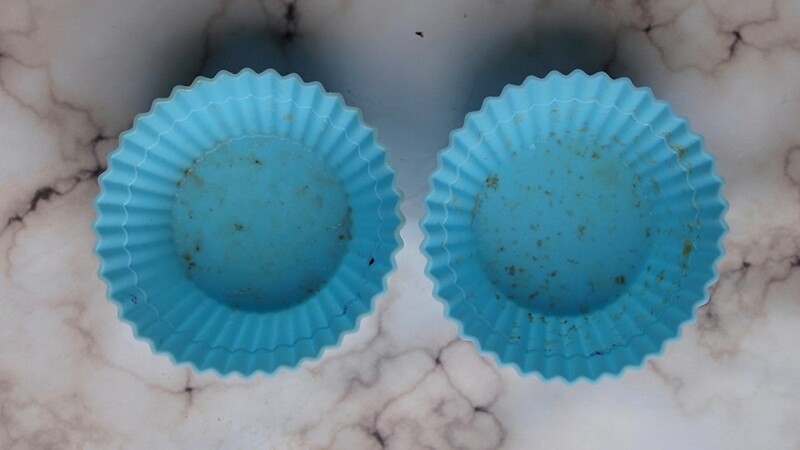 Cleaning larger silicone baking pans is pretty easy, but cleaning the smaller ones (especially the mini-muffin cups) is more difficult, partly because there are so many of them! Here's the most efficient way I get around to washing these. Immediately toss the empty cups into warm, soapy water. Rub the crumbs out of them. Rinse them, and let them dry. After they're dry, I may give the cups an additional wipe with a damp cloth, especially if I've made savory muffins in them because they're more likely to harbor some residual grease. And lots of other savory snacks. So don't just make sweets with your cups; use them for all they're worth! In addition to baking both sweet treats and savory snacks in silicone baking cups, I recommend using them (again, mostly the smaller ones) for more than just baking. 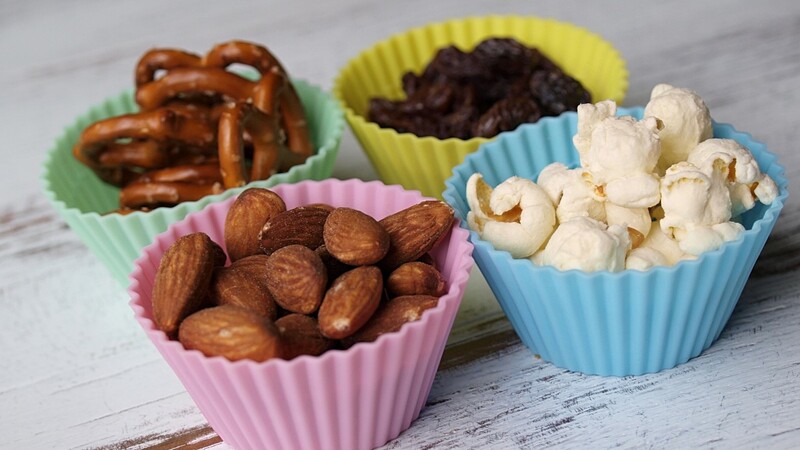 They make great little serving cups for parties—you can put small snacks in them like jellybeans, nuts, and small candies, and because they come in such cute shapes and colors, they can really fancy-up a party platter! The extra benefit here is that, unlike other little serving cups, they are washable and reusable. How lovely and eco-friendly is THAT? What really got me started on silicone baking molds was not an attraction to their fun shapes and bright colors but rather the prospect of being able to make muffins and cupcakes in a small dormitory kitchen, where I honestly did not have the space for a metal muffin pan. The great thing about these baking cups and molds is that they stack brilliantly and take up about as much space as an espresso or coffee cup (depending on their size). This means that you can use these cups as an excuse to get rid of some of your bulkier baking pans! That said, I recommend holding on to your old-fashioned metal cake pans. I have both metal and silicone cake pans and NEVER use the silicone ones. They're just an accident waiting to happen. As I just mentioned above, there are some instances in which I would advice against converting to silicone. This is the case with pretty much all larger baking pans. Why? When it comes to larger cakes, it is better to have a rigid, more-supportive material. The one time in which I would advocate the purchase of a larger silicone cake pan is if it's a specially shaped novelty pan, but only if you can't find the same shape in a metal pan. So as a general rule of thumb, I'd just opt for metal pans when dealing with larger confectionary treats. With larger confections, silicone can bend; whereas metal would be rigid. Something to keep in mind if you're considering making a cake with this type of bakeware. You do want to keep an eye on the temperature rating to ensure that you don't accidentally melt your pan and ruin all of your hard work. Different pans/cups might have different temp ratings. Typically, they can withstand temperatures from about -40 degrees Fahrenheit to 446 degrees Fahrenheit, but you will want to check your individual cookware items to ensure they can withstand the cold or heat—and this is especially true if you're cooking at very high temperatures! Not all silicone is created equal. Well, maybe it is, but it's not all manufactured equally. You want to ensure that you're getting pure silicone, not something that's had filler added. Adding filler reduces the manufacturing cost of silicone item but sacrifices its overall quality. So how do you tell if you're getting good, pure silicone? Simple! Pinch the silicone and twist it a bit. If it stays the same color, you've struck silicone. If it turns white, you've got silicone with some filler in it. 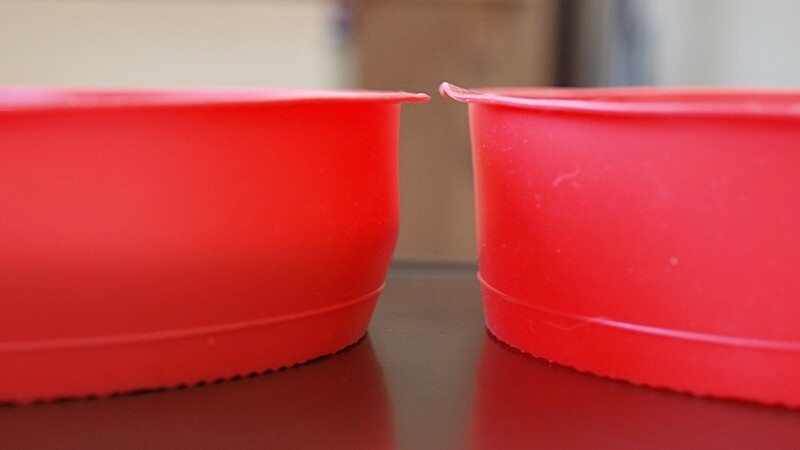 The cake pan on the left can't be pinched as much as the baking cup on the right because the one on the left is much stronger and made of 100% silicone. The cup on the right, however, has filler in it. That's why it turns white when bent. How do you use silicone molds? Ensure that your silicone is clean. Grease your pan or mold in some way. Clean the pan/mold with soapy water or put it in the dishwasher. Can you put silicone in the oven? Yes, most silicone is heat-resistant up to about 440 degrees Fahrenheit. Check your pan or mold (or its packaging) to get an exact temperature rating (TR) for it. The TR for it will give you your cookware's temperature range. 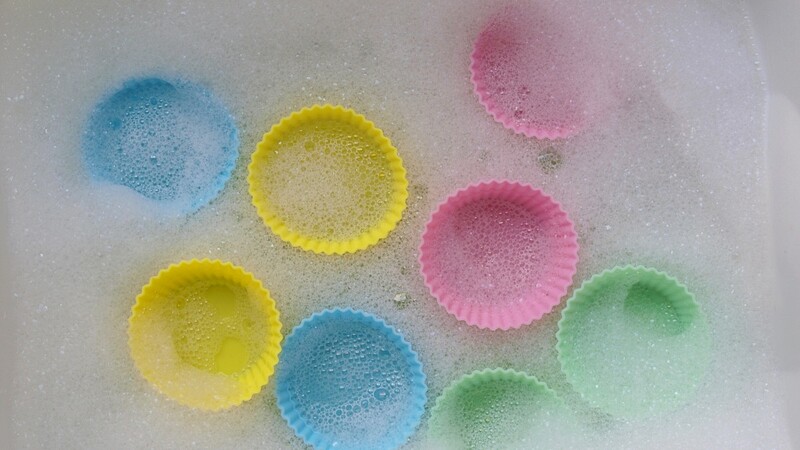 Do you have to grease silicone cupcake liners and cake pans? No, you don't have to. But if you want to make clean up a breeze and save yourself some time, you should definitely grease whatever you're about to cook in. 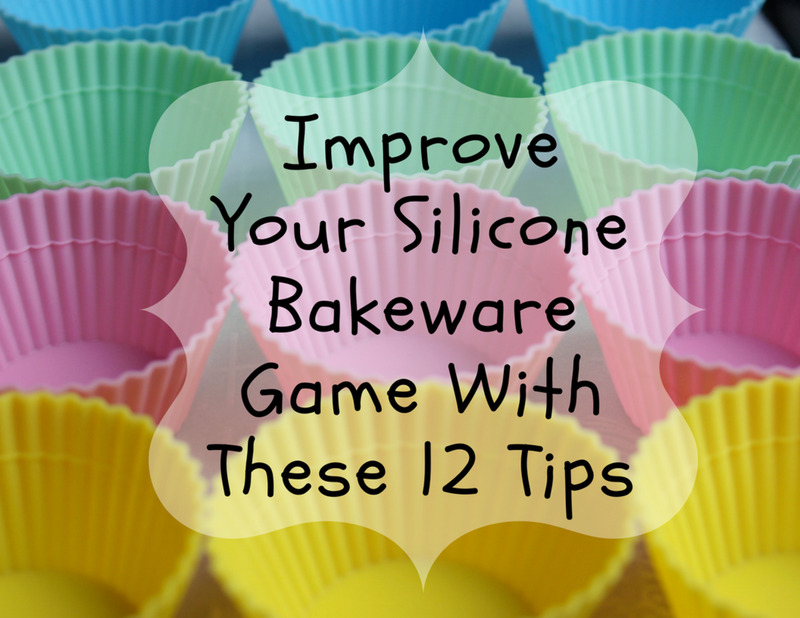 Do you put silicone bakeware directly on the oven rack? Yes, you can put the molds directly on the over rack. However, for stability, you may want to place them on a cookie sheet. Is it safe to cook and bake with silicone cookware? Research is a little spotty, but the succinct answer seems to be "yes." RubberCal has a well-researched, plain-English article on what it means to be FDA food-safe rubber, which is what you want to look for when buying quality silicone cookware. Can I put silicone bakeware in a pressure cooker? There are a lot of people asking this question, and not a lot of people willing to experiment to get the answer (or so it seems). 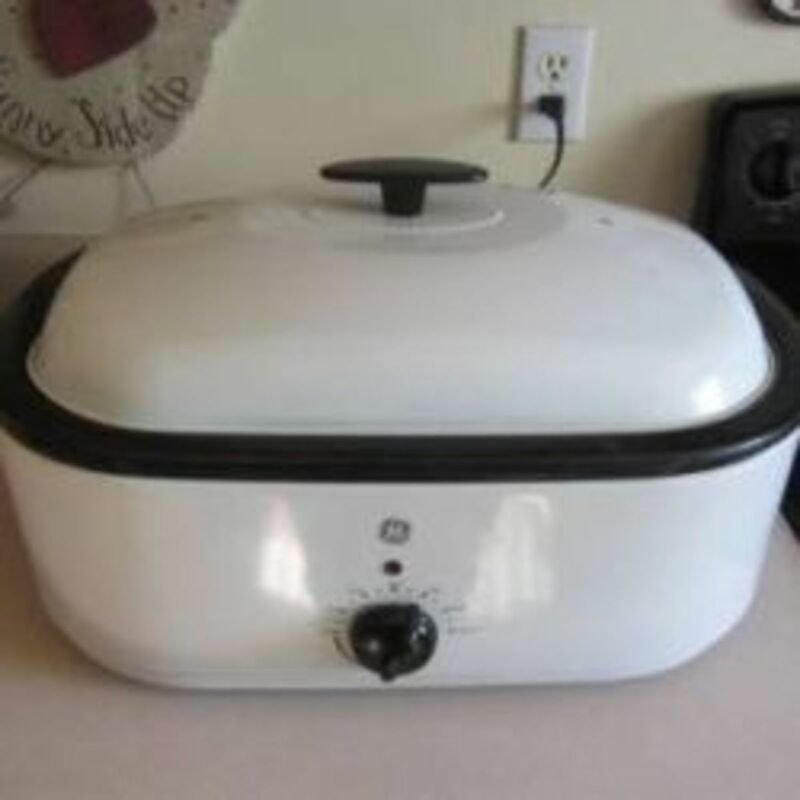 Some companies, such as OXO, make pressure-cooker-specific silicone cookware. But should you put your perhaps-not-specifically-for-the-pressure-cooking cooking item in the pressure cooker? It seems to depend on the quality of your silicone and how close you place it to the cooker's heat source. There doesn't seem to be one straight-cut answer. 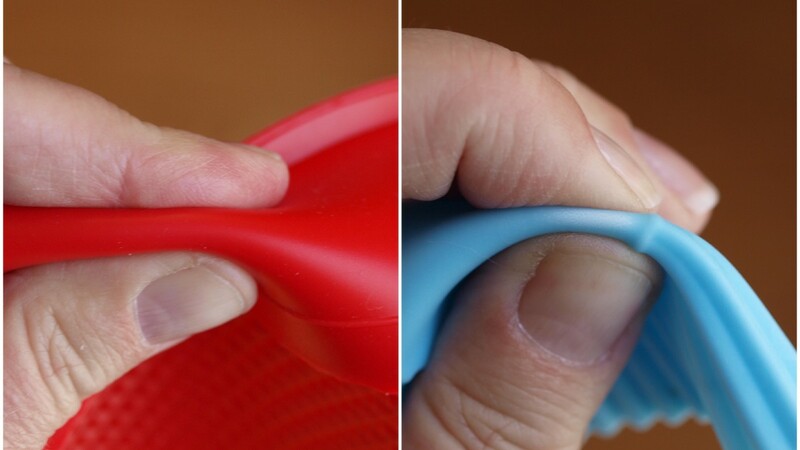 Easy clean up: You can flip silicone inside out and get into those hard-to-reach corners. You can soak it without worrying that it's going to get rusty or damaged. This makes clean up a breeze! Durable: Unlike metal, you don't have to worry about silicone developing rust over the years. Unlike glass, you don't have to worry about this material shattering if you drop it. Yes, it's an investment, but it's been worth it for me. Space-saving: As mentioned earlier, silicone can be a huge space-saver. So, instead of having to have a barely used metal muffin pan banging around in your cupboard, you can have some soft, pretty silicone muffin cups that take up about the same space as a coffee cup! 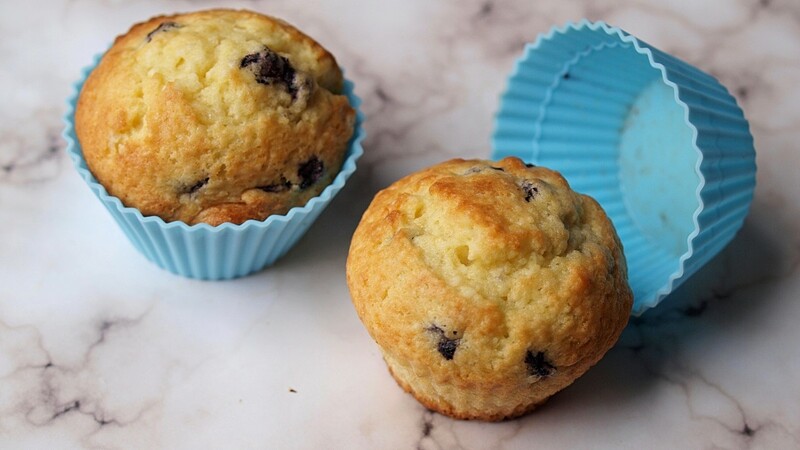 Reusable and environmentally friendly: If you use a metal muffin pan, you've got to use those paper muffin cups—which will inevitably be thrown away. But with the silicone version, you eliminate the need for those paper cups, so you're creating less paper waste by doing so. Safety research is spotty: This is exactly what it sounds like. 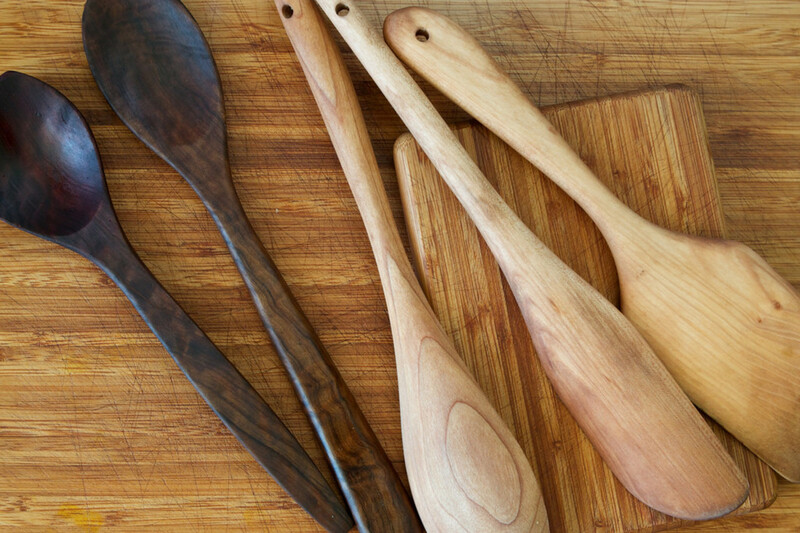 There's not a lot of research out there about whether or not cooking silicone is safe. That means there's not a lot of "it's safe" or "it's not safe" literature. So, you'll have to decide for yourself! I personally think it's fine and quite enjoy cooking with it. It can melt: Silicone isn't made to be used on direct heat sources such as a grill plate, a stove top, an open flame, or a broiler. Using it on one of these sources is really likely to melt it. It can degrade: Some people, such as the SF Gate, have claimed that silicone can get punctured and degrade in other ways. My guess it that this has to do with the quality of silicone that you buy. Did you buy the stuff that turns white when you pinch it? It's probably going to bite the dust before a product that doesn't do that. Additionally, I don't really think the "degrading" is a con because nothing lasts forever! Glass shatters and metal rusts. No material is perfect. 4.5- vs. 5- vs. 6-Quart? 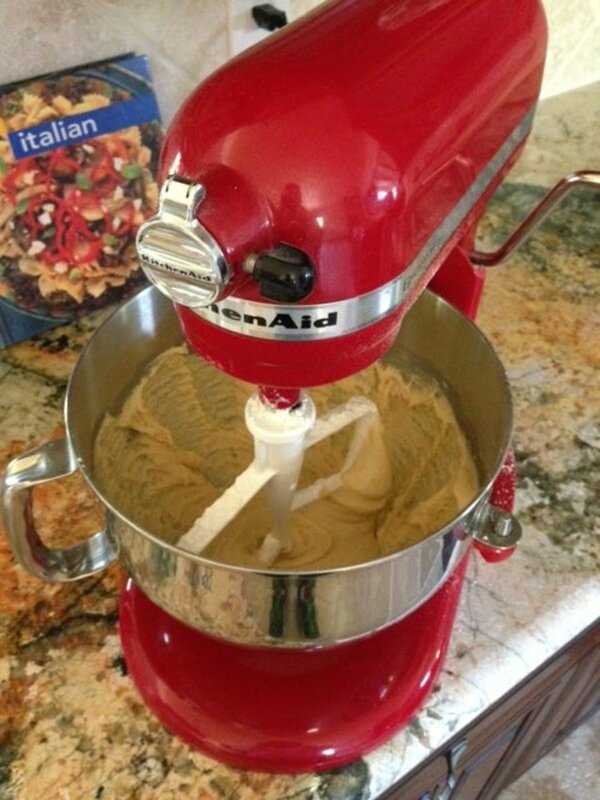 Which KitchenAid Stand Mixer Is Right for Me? Size Does Matter! 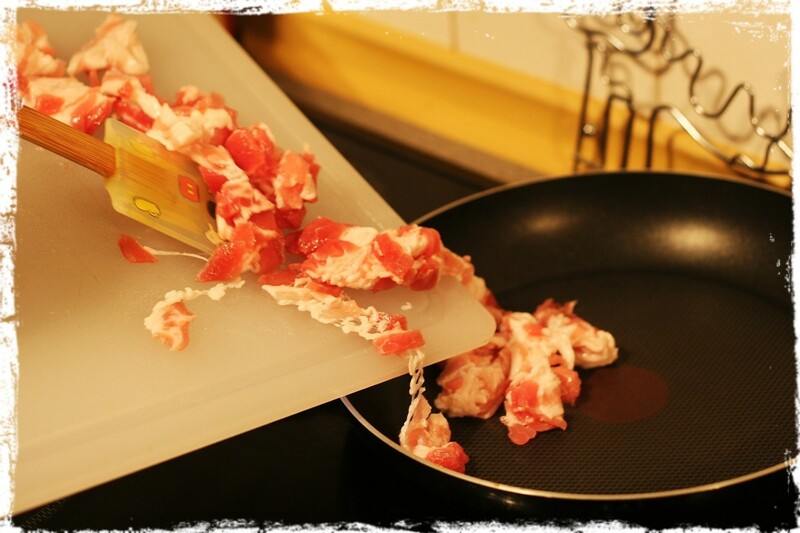 What is your top tip for using silicone kitchen tools? I’ve been using the silicone baking pans for cupcakes, loafs,and cakes for a couple of years. I alway place the silicon pan in a corresponding metal one to hold its shape. I don’t clean the metal holder. For washing I turn the silicone mold inside out and clean all surfaces, then put it in the dishwasher. Silicon use in pressure cooker.?? Thanks very much for your tips. Sofar I have only used my moulds for freezing tomato puree which works very well too. Today I'll start baking! Does the temperature change for silicone. Or do you just use the temp as it days on the recipe? Can a Silicone mould be used in a Pressure Cooker for baking a cake?? I got square silicone baking cups from Publishers Clearing house. My question: do I put them on a baking pan or directly on the wire oven rack? Good information I would like to know if I can use silicone moulds in an otg ? Very useful tips. Can I use these molds both for microwave oven as well as for OTG? I like t use my mini silicone cupcake molds in my Bento. It is great for keeping the pickles and olives separate, for example. Good article. Can you use silicone molds for steaming? Thanks. Useful - got to admit, I do have some silicone bakeware but I don't use it much. I still have to get used to the idea that it won"t melt in the oven. Anyhow, I do have some silicone moulds that I use for soap making - they are great for that. The spelling of flour is incorrect. It's spelt as flower, which is wrong. I bought some silicone bakeware not long ago and I have to agree the smaller ones are far better. I also have some mini muffin moulds and they are super cute. Very helpful. Thank you. I have long considered buying some silicone baking molds but wondered if I would like them. I certainly considered the drawbacks of the larger molds flexing on my and dumping my batter all over the place. :( I think I might try the cupcake molds now. Loving this! It seems I haven't been treating mine right. I have a set of bread, quiche and other baking silicone stuff, baking sheet is the only one I use though because the rest tend to misshape under any kind of pressure like you say! Thanks RTalloni! I say make the switch, but only with the smaller baking cups. Stay away from larger silicone pans. I've never seen these in person. I wouldn't buy novelty shapes. I am very much a person of multiple usuage in everything I buy. Really good tips on silicone baking pans. I have wondered whether I wanted to make the switch.